Learn to knit lace with this knitting workshop with Heather Zoppetti and learn how to read lace knitting charts, knit simple lace patterning, and more. Elegant and intricate, knitted lace can also be satisfying to create. Instructor and designer Heather Zoppetti shows you what makes lace her favorite pattern to knit and teaches the skills to make it yours, too. Work special increases and decreases for pictorial effects. Uncover the secrets of lace knitting charts. Transform your lace with blocking techniques. Troubleshoot and prevent mistakes in complex patterns. 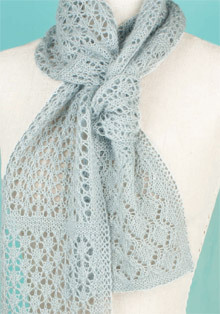 Plus, practice lace knitting with the lace sampler scarf pattern PDF, included with this workshop! This workshop is available on DVD or a video download in standard or high definition. 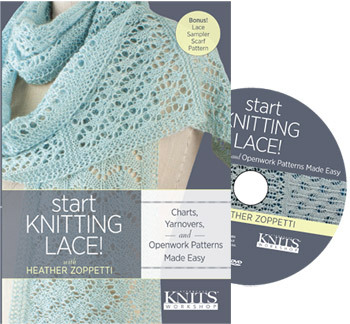 Grab your copy today and start knitting lace!